The Company and Securities Law Journal (ISSN: 0729-2775) is well-known for its high-quality articles written by leading specialists in corporate, securities and takeovers law. It provides both scholarly and practical perspectives on a range of dynamic and important subjects of interest to the Australian legal and business communities. Edmund Finnane is a barrister at Thirteen Wentworth Selborne Chambers in Sydney and a Director of the Commercial Law Association of Australia. Edmund earned his Bachelor of Arts and Bachelor of Laws at the Australian National University, and completed his Master of Laws at the University of New South Wales. Before coming to the Bar in 1997, he was a solicitor with Madgwick Partners. He practises in a wide range of areas, with special relevant interests in insolvency, company, general commercial law and equity. Edmund is the co-author of the books Pleading Precedents and Equity Practice and Precedents, the 2019 edition (2nd) of which is to be published shortly. He has also had articles published in the Law Society Journal and the Commercial Law Quarterly, and has been writing annotations for the Corporations Legislation volumes of Thomson Reuters since 2010. The latest Part of the Company and Securities Law Journal includes the following articles: “Is Say-on-Pay the Answer to Executive Remuneration Problems in New Zealand?” – Tameela Bandara; “Australian Enterprise Risk Management Practices and Corporate Governance” – Dr Bobae Choi, Dr Doowon Lee and Dr Michael Seamer; and “Misleading and Deceptive Conduct in Global Financial Markets: Implications for Regulators, Financial Intermediaries and Credit Rating Agencies” – Professor Tony Ciro. This issue also includes the following sections: Editorial; Hong Kong, Singapore and Malaysia: “Supporting Fintech and SME Fundraising in Hong Kong” – Say Goo. Thomson Reuters is very pleased to welcome Edmund Finnane to his new role as General Editor of the Company and Securities Law Journal (C&SLJ), taking over from the late Professor Robert “Bob” Baxt, who was the Founding Editor of the Journal. Edmund is a barrister at Thirteen Wentworth Selborne Chambers in Sydney and a Director of the Commercial Law Association of Australia. Edmund is the co-author of the books Pleading Precedents and Equity Practice and Precedents, the 2019 edition (2nd) of which is to be published shortly. He has also had articles published in the Law Society Journal and the Commercial Law Quarterly, and has been writing annotations for the Corporations Legislation volumes of Thomson Reuters since 2010. 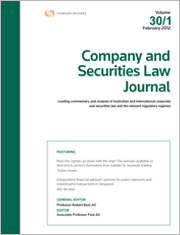 The latest Part of the Company and Securities Law Journal includes the following articles: “The Penalty Quantum for Non-compliance with Corporate Disclosure: Solace for the Market” – Larelle (Ellie) Chapple, Thu Phuong Truong and Michelle Welsh; “An Analysis of Challenges to ASIC’s s 920A Banning Orders against Financial Services Providers in the AAT and the Courts” – Dr Robin Bowley; “Related Party Dealings Out of Managed Investment Schemes: Four Quandaries Addressed” – Tom Clarke; and “Risky Business and the Safe Harbour: Evaluating the Insolvent Trading Reform from a Creditor Perspective” – Emma Norton. This issue also includes the following sections: Editorial by Edmund Finnane; and Directors’ Duties – Dr Rosemary Teele Langford: “A Reconsideration of s 1324(10) of the Corporations Act 2001 (Cth): Damages in Lieu of an Injunction” – Dr Katy Barnett. The latest Part of the Company and Securities Law Journal includes the following articles: “Directors’ Duties to Respect Human Rights in Offshore Operations and Supply Chains: An Emerging Paradigm” – Riana Cermak; and “Consumer Protection and Life Insurance Claims” – Andrew J Serpell. This issue also includes the following sections: Editorial; Corporate Insolvency – Helen Anderson: “Harmful Phoenix Activity and Disqualification from Managing Corporations: An Unenforceable Regime?” – Jasper Hedges, Helen Anderson, Ian Ramsay and Michelle Welsh; and New Zealand – Gordon R Walker: “McIntosh v Fisk  NZSC 78: New Zealand’s Largest Ponzi Scheme and the Liquidator’s Clawback Powers: The Supreme Court Decision” – Trish Keeper. Featuring an obituary penned by the Hon Reg Barrett, the Australian Law Journal has joined the legal profession in paying tribute to Professor Bob Baxt AO, one of the Journal’s most longstanding section editors and contributors, following the news of his passing on 11 March 2018.